Myra McEntire: In the Fort with Tessa Gratton! In the Fort with Tessa Gratton! Really and truly, Tessa Gratton is one of my very favorite people. She's funny and warm and tolerant of my crazy and all kinds of lovely things. So, OF COURSE, she HAD to visit The Fort to celebrate the release of her debut, BLOOD MAGIC! About Tessa: When I was a kid, I wanted to be a wizard. Or a paleontologist. Maybe both. I'm neither now, but magic and monsters are still my favorite things. Born in Okinawa, Japan while my Dad was on duty with the US Navy, I moved around throughout my childhood and traveled even more. Reading and theater were the two things that got me through it all. After graduating from the University of Kansas in 2003 with a degree in Gender Studies, I went on to graduate school for a Master's in the same. Halfway through, I ditched my advisor in favor of Anglo-Saxon and Germanic epic poetry, because the blood, tragedy, and violence were much more civilized than academic in-fighting. I don't have a graduate degree, but I did translate my own version of Beowulf! Despite having traveled all over the world, I settled in Kansas (where the flying monkeys live) with my partner, two cats, and a mutant mutt named Grendel. Because I was raised on fairy tales and dinner-time conversations about emergency room patients (thanks, Mom and Dad!) I tend to mix magic and blood whenever possible. About BLOOD MAGIC: This page-turning debut novel will entice fans who like their paranormal romances dark and disturbing. 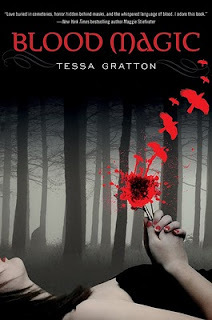 It's a natural next-read for fans of Stephanie Meyer, Carrie Jones, and Becca Fitzpatrick. But instead of mythical creatures, blood magic has everything to do with primal human desires like power, wealth, and immortality. Everywhere Silla Kennicott turns she sees blood. She can't stop thinking about her parents alleged murder-suicide. She is consumed by a book filled with spells that arrives mysteriously in the mail. The spells share one common ingredient: blood, and Silla is more than willing to cast a few. What's a little spilled blood if she can uncover the truth? And then there's Nick—the new guy at school who makes her pulse race. He has a few secrets of his own and is all too familiar with the lure of blood magic. Drawn together by a combination of fate and chemistry, Silla and Nick must find out who else in their small Missouri town knows their secret and will do anything to take the book and magic from Silla. Sun worshipper, spray tan or SPF 50? SPF 50. Though I've read studies that suggest anything over about SPF 30 doesn't make a difference. Beach or lake? Boat or shore? Open windows. I love wind. Um. Raft. Esp if there are rapids. High dive, low dive or cannonball? Ghost story or not? Do you remember any favorites from the past? YES! I loved all of the Scary Stories to Tell in the Dark, by Alvin Schwartz. <3 Used to terrify my littlest brother by telling them to him. My favorite was the one about Harold the scarecrow, who stole your skin for his own. Gruesome! Truth. It's scarier than dares. What singer/musician/band is a must have for The Fort soundtrack? Justin Timberlake, obviously. Though I've been listening to The Airborn Toxic Event a lot lately, and they'd make good summer camping fun. What movie would you bring to watch? Who's the ideal mascot (usually cute boys, or one time, a unicorn, or that other time, Sue Sylvester) for The Fort and why? 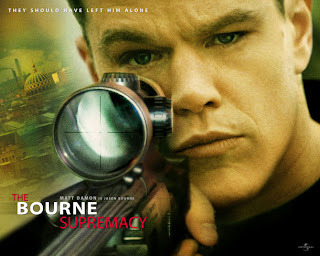 Jason Bourne. Hawt, fierce, bold, prone to amnesia. Heheheh. Marshmallows, lightly toasted or burned to a crisp? Lightly toasted if I'm eating them. If I'm just playing, they're fun to burn and twist into sticky black shapes. Awake all night or first one to sleep? Awake all night, if I'm hanging with Myra! If awake all night, practical joke or no (and what kind)? Naw, I'd rather play "Light as a feather, stiff as a board." If you could have any YA author visit The Fort and tell stories, who would it be and what story would you ask them to tell? Carrie Ryan - I'd ask her to retell the endings of her favorite YA books. Having experienced this before, I'm SURE it would entertain everybody! Myra: I have also experienced this, and it is TRULY SPECTACULAR. Thanks for visiting, Tessa! Now everyone run out and buy BLOOD MAGIC! You'll love it! Here's what the rest of the Bookanistas are up to today! What a fun interview! Tessa seems like such a great person. Sooooo I think we need to all get together to drink mojitos and play light as a feather. I can't wait to read Blood Magic! My copy's in the mail. So great!! I just finished Blood Magic and SWOONED all over it. Thanks for the interview, ladies! Dying to read Blood Magic (and Hourglass, of course! ).